Puffer fish are chubby yet cute looking fish that are found all over the world. They can be a challenge to keep but they are very rewarding for experienced aquarists. This tropical fish comes in most colors and sizes. The many species have peculiar and unique hunting techniques that are mesmerizing to watch. They are well known for their dangerous venom, known as tetrodotoxin. But don’t worry, they cannot produce it themselves and therefore are mostly harmless in captivity. Keep reading if you want to learn more about freshwater puffer fish including where to find them and how to successfully care for them. All puffer fish belong to the family Tetraodontidae. Puffer fish are tropical fish found in marine, brackish and freshwaters across the world. There are over 150 species, and only around 30 of them live in freshwaters. 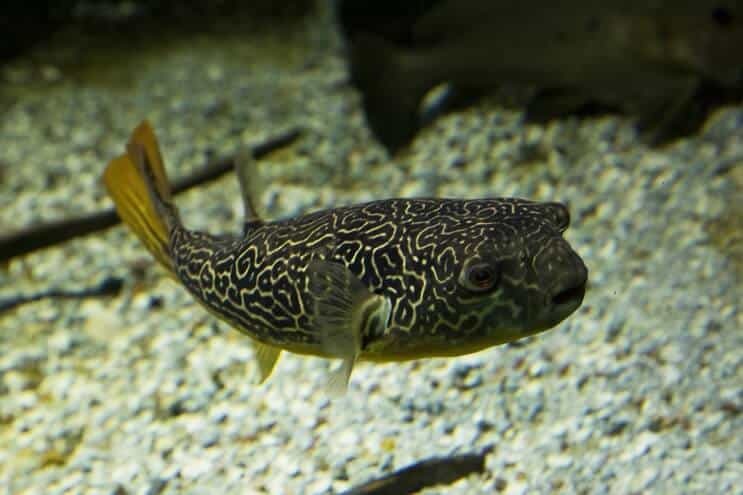 This guide will focus on freshwater puffer fish. They are well known for their ability to puff themselves up with water as a defense mechanism. Once they inflate, their spine protrudes from their body preventing them from being eaten. Don’t be deceived by their appearance! Even though they are very cute, they can be extremely aggressive. They are best kept in a single specimen tank due to their specific feeding times, care needs and aggression. One of the most known and most studied characteristic about these fishes is their very deadly neurotoxin, known as tetrodotoxin. This is a defense mechanism to protect them in the wild. Luckily not all puffers are poisonous. These fish do not produce the toxin directly, but instead they gather bacteria that create the tetrodotoxin for them. They gather this bacteria from their diet that they eat in the wild, so no worries, your fish will be toxin free because they won’t be eating this in the aquarium. Puffers can live up to 10 year in an aquarium if well cared for. They are moderately priced depending on the species. Prices can vary between a few dollars to more expensive specimen such as Mbu puffer fish which is around $100. Even though they look cute they are very aggressive and territorial – particularly during breeding seasons. 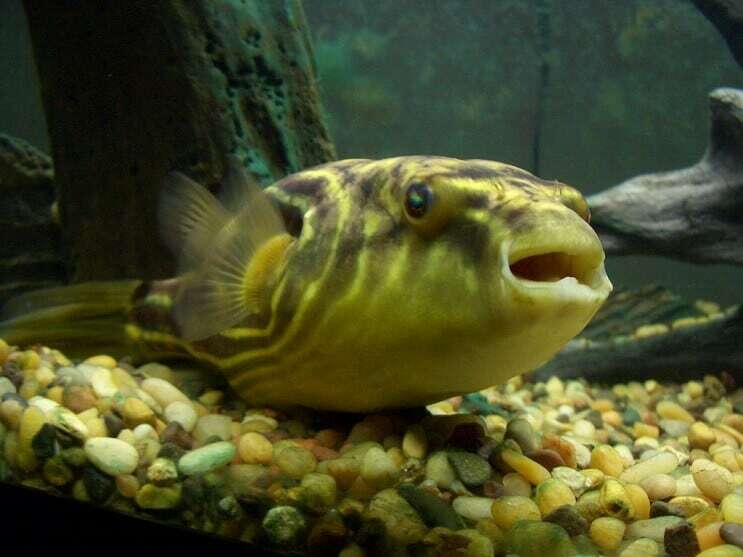 Puffers are ferocious predators, with many different hunting techniques. Open Waters Hunters: The Golden Puffer and the South American puffer swim over rocky and sandy substrate looking for a prey. They swim over plants or oyster beds looking for small crustaceans, snails or clams to eat. Stealth Predators: The crested puffer fish, the dwarf puffer and the red-tailed dwarf puffer prefer to stay hidden. They are usually found in overgrown riverbanks and places with plenty of hiding spots and like to attack from the shadows. Ambush Predators: The last class of hunters is known as the ambush predators (such as the congo puffer). They dig themselves into the sand waiting for a fish to come by and then lunge upward for the kill. A bad habit which most puffers have, is that they are fin-nippers. Notorious fin nippers are all the species of Auriglobus and Chonerhinos. Another peculiar behavior observed among many species is their ability to spit or blow water over the substrate to uncover hidden prey. They have been known to spit water at you from the surface to ask for more food. 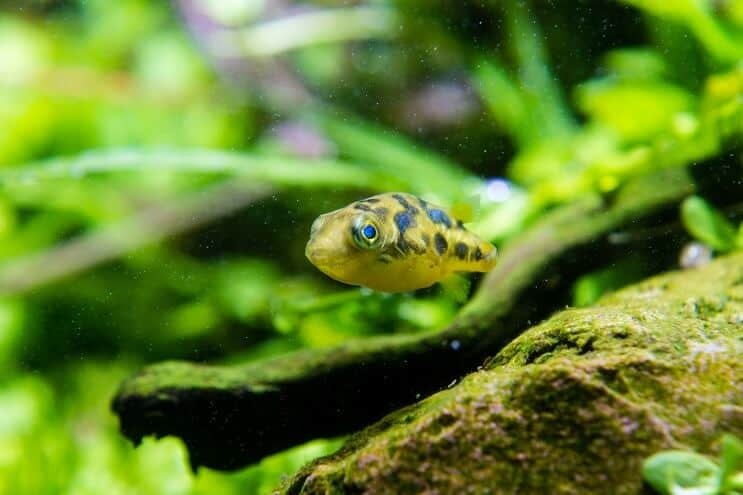 Avoid the green spotted puffer for a freshwater tank. There are more than 150 species of puffer fish in the world, however, only about 30 of these are considered to be truly freshwater. They all vary significantly in shape, size and color. Going from 1″ such as the Dwarf puffer to over 24″ such as the Mbu Freshwater puffer. These fish are quite stocky and chubby looking. They look almost like a box with small short fins sticking out. They have 4 large teeth fused on their jaw which is often covered by lips. Their lips are quite full, and puffers use them to test the texture of potential food and decide if it is worth eating. With no scales, their skin is covered with spikes. Depending on the species, spikes can be very visible or very thin and invisible (until the puffer inflates). They all require good camouflage techniques and most are light grey, with a cream colored base and green above. 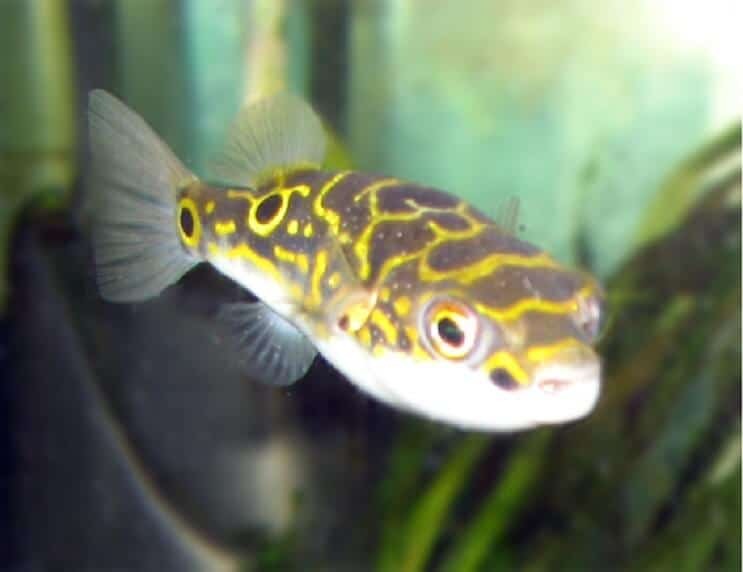 Often, the Spotted Green puffer is considered a freshwater species. However, this is wrong. They spend their life cycles in different water conditions. When they are juveniles they live in a freshwater environment, however as adult they need brackish waters. Freshwater puffer fish are tropical freshwater fish inhabiting water systems in the tropical and temperate regions of the world, such as rivers and lakes. You can find puffers in South East Asia, India, Bangladesh, South America and in Africa. 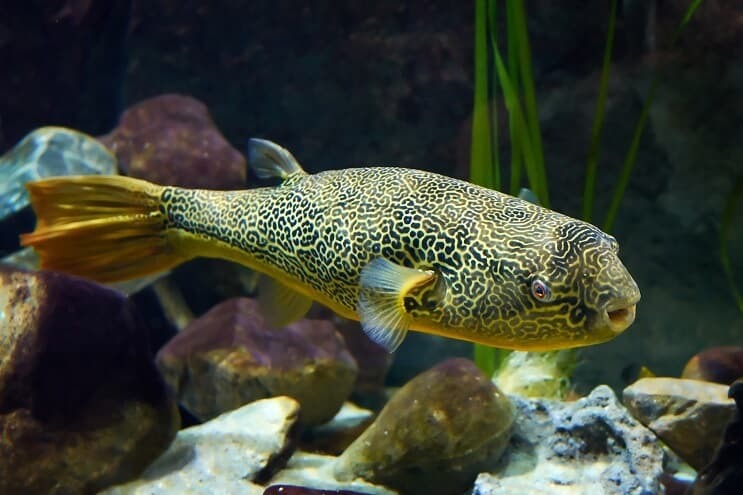 They mainly live in riverbanks with dense vegetation, but they can also be found in lakes (for example the Mbu puffer fish in Lake Tanganyika). Freshwater puffer fish are very susceptible to diseases, so you need to provide the best environment possible for them. These fish do best when kept in waters with a pH of 7.0-7.6 and temperatures between 74°-78°F. Other water parameters such as water hardness and currents depend on the specific species and their natural habitats. Most species will be fine in a tank with a low water current (the filter will produce enough of a water current) and a dKH between 8-12. 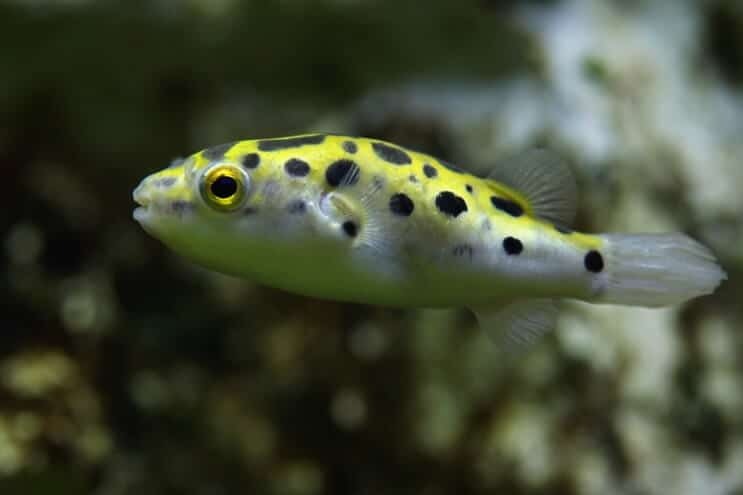 Puffer fish are generally very sensitive to deteriorating water conditions and very susceptible to levels of nitrate, nitrite and ammonia in the water. They also produce a lot of waste and so a good filter is mandatory with a suggested 50% water changed weekly. You might want to purchase a double filtration system with heaters and a special lighting system. Generally, freshwater puffer fish need a well planted aquarium with plenty of crevices and hiding places. 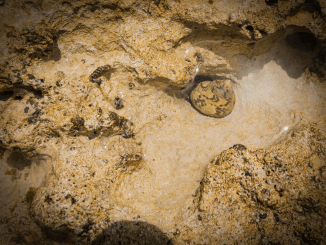 Ambush predators prefer soft substrates to easily dig and hide in. Stealth predators require dense planted tanks with lots of tree roots, plants and crevices. Finally, open water hunters need plenty of open spaces for swimming with elements for them to explore such as rocks, plants and bogwood. The larger the tank, the better due to the amount of waste they create. These recommendations are for one fish only. Usually its better to keep puffer fish alone; however, there are a few species that can be kept in groups (more on this later). No matter the species, freshwater puffer fishes are extremely territorial and aggressive. They will show a different temperament during different life stages. So, even if they are good community fish when they are juveniles they can become very aggressive during adulthood. These fish are not for community aquariums and are best kept alone. They are veracious fin nippers and get bored quite easily, a combination that can result in a catastrophe if paired with other fish. Also, non-fish companion such as snails and shrimps are discouraged as they will be eaten. Puffer fishes are best kept alone. However, there are a few species that can be kept as a pair or small groups. The Figure 8, South American and the Ceylon puffer can all be kept in small groups. Freshwater puffer fish do not have any scales so they are very susceptible to ectoparasites. The most common parasites are usually cause by Protozoa living in their gills, fins and on the skin. The most common parasites are known as Oodinium sp., Ichthyobodo sp., Chilodonella sp. and Trichodina sp. 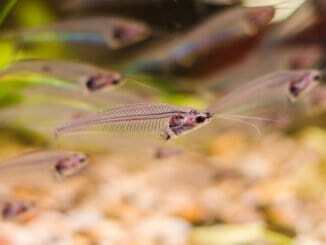 One of the most common parasites among ornamental freshwater fish is known as the Ich disease caused by Ichthyophthirius multifiliis. This can be treated quite easily by raising the temperature of your aquarium. Preventing the disease is always better. 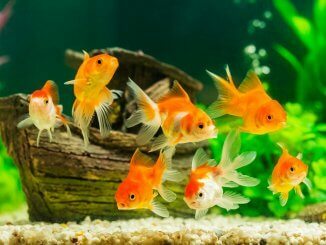 New additions to your aquarium are potential carriers of disease and bacteria. Try to be careful when introducing new things to your aquarium and make sure to quarantine them. Scaleless fish, like Puffers, are particularly susceptible to diseases because they lack the first line of defence, scales. It is very important that you are very careful maintaining the right water conditions and keeping your tank clean. Investing in a good filtration system will prevent a lot of problems. Puffer fish are considered omnivores, however they prefer a meat-based diet. In their natural habitats they tend to eat snails, crustaceans, shellfish and other fish (yes, even whole fish). They will eat pretty much anything you put in the tank. You can feed them live, frozen and dried meat. Bigger size puffers can eat small frozen fish such as lancetfish or whitebait fish. You can also feed them vegetable and plant based food once or twice a week. Their teeth are an important aspect to consider as they keep growing during their whole life. You might need to feed them hard substrate animals such as shellfish, crustaceans or snails to help them control their teeth growth. If their teeth grow too long, your fish will struggle to eat and you will need to clip them. Depending on the size of your puffer fish, they require different feeding habits. Small Species (under 2″): Need to be fed daily. Mid-size Species (2-4″): Need to be fed every other day. Large Species(4+″): Need to be fed two or three times a week. Try to not over feed your them; they are very good at earning more food by doing things to try and impress you such as squirting water at the top of the tank. Breeding puffers in captivity is very difficult. Different species require different water parameters and conditions. Also given their temperament, find a matching pair can be difficult. If you are fortunate enough to get a pair, the most difficult part will be raising the fry. Generally, puffer fish are extremely protective of their eggs, however when hatched the parents will probably eat them. Providing enough food for the fry is very difficult and they are very sensitive to water quality. You can feed them brine shrimp and infusoria. As all of these challenges makes breeding these fish and raising their fry incredibly difficult but very rewarding. Puffer fish are found across tropical water bodies, from freshwater to marine environments. There are at least 30 species of freshwater puffer fish around the world, all different in sizes and colors. They are well known for their ability to puff up as a defense mechanism, a characteristic which they have evolved to protect themselves. These fish are recommended for experienced aquarists due to their special feeding needs and sensitivity to water conditions. Even though their temperament is aggressive, they are very intelligent and will soon grow to recognize you, especially during feeding times.